A graduate of UC Davis, School of Veterinary Medicine, Victoria. Joseph DVM is board certified in Avian Medicine. Dr. Joseph brings thirty years of experience as an avian & exotic animal clinical veterinarian and avian & exotic animal veterinary laboratory consultant. She founded the Bird & Pet Clinic of Roseville, a six-doctor practice seeing greater than 50% exotics. For over 20 years, Dr. Joseph was a contract veterinary consultant working for IDEXX Laboratories. During this time, Dr. Joseph consulted on laboratory diagnostics for avian and exotic patients, evaluated blood smears, provided continuing education to the technical staff and was actively involved with the avian and exotics standards team and exotic reference committee at IDEXX. She is currently medical director for the California Foundation for Birds of Prey, a raptor rehabilitation facility in California. 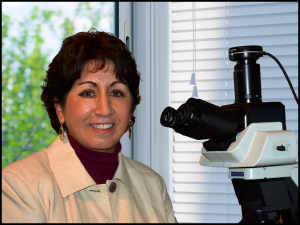 Dr. Joseph is recognized internationally for her ability to teach avian, reptile and exotic animal hematology, providing detailed information for clinical interpretation. Dr. Joseph has the unique ability to recognize the clinical signs of disease, interpret the laboratory findings and develop a practical approach to diagnosis and treatment. CAPS (Clinical Avian Pathology Services) is dedicated to providing the highest quality of informative teaching with webinars, face to face case discussions, written interpretation of laboratory results and on site hematology evaluation for avian, reptile and small exotics. CAPS hematology slide collection is a powerful tool, emphasizing cell types and variations of cell morphology. The ability to read and interpret the hematology and chemistry results for these special patients is imperative to providing the highest standard of medicine. As doctors and technicians learn to evaluate the blood smear with confidence, decisions pertaining to the medical care and therapy plans can be immediately addressed. CAPS goal is to provide the tools the veterinarian and technician need to fully evaluate their exotic patients, interpret the laboratory results with confidence and provide a therapy plan that is all inclusive for the patients’ well being.